It’s the time of year when love is in the air!! 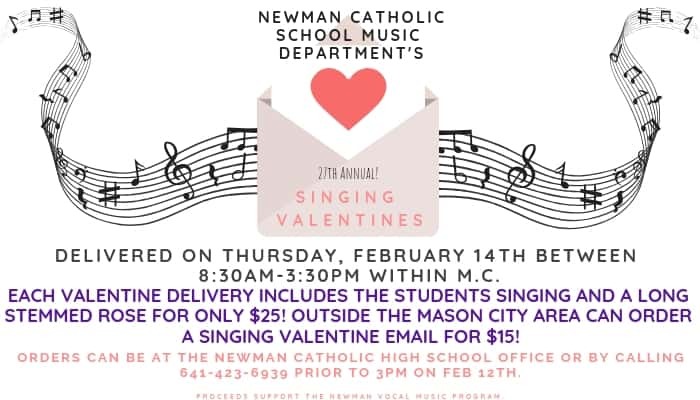 The Newman Catholic High School Choir members will once again be delivering Singing Valentine’s to bring that special smile and warm the heart of that special someone in your life! We will deliver a long stem rose and a sing a song, in the Mason City area, for $25. Song choices include our traditional favorites “Let Me Call You Sweetheart” and “You Are My Sunshine”. We added a peppy new song choice last year called “Forever Friends” of which is also available this year! If you would like to send a Singing Valentine to someone outside of the Mason City area, we are offering a Video Singing Valentine option! The choir will sing/record “You Are My Sunshine” and we will send it via email to your out of town special someone! We will also personalize it with the greeting that you would like to say to them. This option will cost $15. Please call the Newman High School office 641-423-6939 or stop by to place your orders today!